Why: This digital scrapbooking script allows you to save various JPG versions of a layered PSD with one click. What: File Save 1 allows you to save the PSD, full resolution JPGs and 72 dpi JPGs in one step. ● Can specify two different size 300 dpi JPGs for saving. ● Can specify three different size 72 dpi JPGs for saving. various copies based on the width specified. 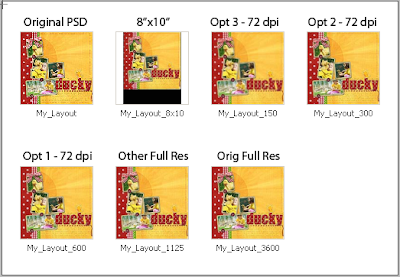 ● File Save 1 provides an option to save square layouts to an 8x10 canvas, ready for printing. ● Metadata is preserved with all copies. How: File Save 1 has a dialogue box that prompts you for which size files to save. You make your selections and/or enter the file sizes and click save to create multiple files in one step. When the script is run, a dialog box appears. This gives you options for what type of JPGs to save. File Save 1 uses the responses to these check boxes and the values in the 'pixels wide' fields to determine which JPGs to create. Original Size: This option defaults to the current size (width, in pixels) of the PSD. You could change it, for example, if you create at a 12”x12” size (3600 pixels wide), but wanted to save your full resolution jpg at 8”x8” (2400 pixels wide). 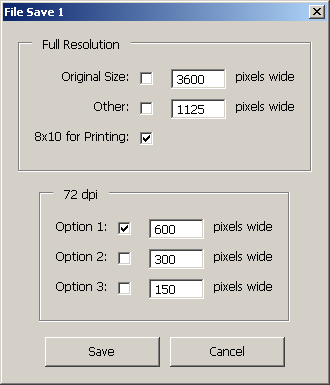 Other: This option can be used for a second version at 300 dpi. For example, a 12”x12” and 8”x8” version could be saved by entering 2400 here and checking the Other box. 8x10 for Printing: This option takes a square layout and puts it on an 8”x10” canvas, for printing purposes. The layout is positioned at the top portion of the 8”x10”. The script uses the current foreground color on the expanded canvas and puts a small solid color border around the top, left and right edges, so that no edge details are lost when printing. 72 dpi – Options 1, 2, 3: These give you 3 options for saving at 72dpi. The defaults are set to 600, 300, 150 but can be changed, if desired, by entering new width values in the boxes. Start with a finished layout (layered PSD). This example is 'My_Layout.psd'. Run the script with all options selected. These are such fun-loving photographs to scrap. Love the beautiful colors and overall design. I rarely miss viewing your awesome layouts at scrap girls. Thanks again for your kindness. I just tried to install your Save 1.. Thank you by the way I love this idea. but PSE 9 told me that it could not save the file, it's not compatible. Have you seen this before?? No, I have not seen or heard of this before. However, PSE 9 was not out when the scripts were written. So, it may very well be that they are not compatible.